Insulated tools for cable jointers and electrical engineers live working up to 1000 volts according to IEC 60900 standard - insulated hand tools are dielectrically tested to 10,000 volts AC. CATU Isomil insulated tools for live working cover all electricians and jointers requirements. Insulated tools are used by live working cable jointers on utility cables during connection and disconnection of PILC, Consac, Waveform and SWA cables, 415v-600v. Insulated tools to IEC 60900 include : insulated pliers (combination, snipe nose, bent nose, flat nose), insulated spanners (adjustable, hexagonal, open-end), insulated screwdrivers (flat blade, Pozidriv, Phillips), insulated cutters (ratchet cable cutters, hacksaws) and insulated tool kits. 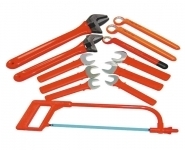 Also : nut spinners, fuse link pullers, sheath lifting tools, tree loppers and jointers umbrellas.